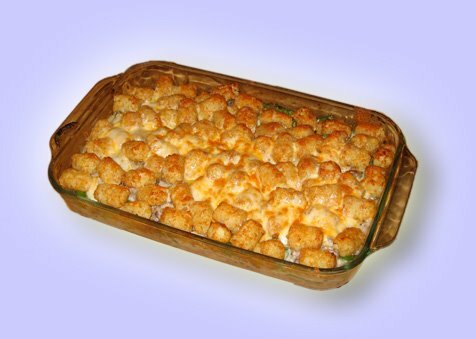 Hotdish is a variety of baked casserole popular in the Midwestern United States, and especially in Minnesota, Wisconsin, North Dakota, and South Dakota. It consists of a starch, a meat or other protein, and a canned and/ or frozen vegetable, mixed together with canned soup. The soup is often cream of mushroom, which serves as a binding ingredient. Hotdishes are filling, convenient, easy to make, and well-suited for family reunions, church suppers, and potlucks, where they may be paired with pan-baked cookies known as bars. Typical ingredients in hotdish are potatoes, ground beef, green beans, and corn, with canned soup added as a binder, flavoring and sauce. Potatoes may be in the form of tater tots, hash browns, potato chips, or shoe string potatoes. The dish is usually seasoned lightly with salt and pepper, and it may be eaten with ketchup as a condiment. Another popular hotdish is made with Kraft macaroni and cheese or plain noodles, canned tuna, peas, and mushroom soup. Cream of mushroom soup is so ubiquitous in hotdish that it is often referred to in such recipes as “Lutheran Binder,” referring to hotdish’s position as a staple of Lutheran church cookbooks. The soup is often considered a defining ingredient.